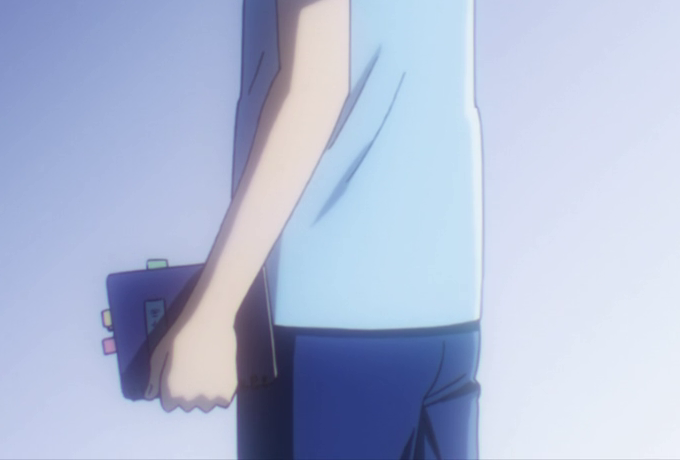 Episode 11 of Chihayafuru season 2 resolved the lingering questions about Arata, as well as the surprising situation from the end of the last episode, in which Tsutomu (aka Desk-kun) was kept from playing in yet another round. Tsutomu is not just a data-gatherer, he also is very good at analyzing the information on hand, as he is able to make something substantial out of the notes that Sumire gathered on their opponents in the semi-final, First Akashi Girls’ High School. I’m glad we are already building up the match against Megumu Ousaka, because it is a good indication that we will get an interesting match-up between her and Chihaya. Aside from that, we still have the final round against Mizusawa’s arch-rival, Hokuo Academy. It seems that the team tournament will take us through episode 13, which should be the mid-point of the series (assuming it is a 2 course season). That means the next course can spend plenty of time on the individual tournament, and still have the Meijin matches as a climax. this episode showed how much chihaya grew as a captain of the team. when taichi was having a hard time deciding whether tsukomu should play or not, she stepped up and decided for the team. furthermore, she even wanted to play against a player who is clearly below her rank and skills just to make sure mizusawa will go to the finals. That would be an interesting twist. I agree that Chihaya has done a lot of growing up over the course of the series. She takes leadership seriously, even if she was bad at it in the beginning. She really does get that they are in a team competition, and that means the interests of the individuals can only be accommodated if they don’t clash with the team goal. from the past two episodes there were two tough school to beat, one is the all girls’ team that they are to face already and the other one is fujisaki high. i think tsukomu already met its captain. i think that would be the team mizusawa will be facing in the finals. They were first mentioned way back in season 1, when before their first match with Mizusawa, Hokuo mentions how they want to go to the nationals to get their revenge on Fujisaki. Then when Chihaya collapsed at the nationals, it was mentioned that it was Fujisaki who finally eliminated Mizusawa while Chihaya was passed out. Not to mention we already know Hokuo pretty well, and have seen them square off against Mizusawa twice. While Fujisaki has only had some preliminary introductions. And our protagonists keep assuming that they’ll face Hokuo in the final round…It all seems to point to Hokuo to lose while we focus on Mizusawa vs. Akashi. But then, this is all based on sports manga logic. Chihayafuru has subverted that before, and I wouldn’t mind seeing a Mizusawa vs. Hokuo tiebreaker match. Wow! I totally missed those references. Now you have me convinced!